This is pesto with a difference. Classic pesto, made with basil and pine kernels, is a distinctly summer affair, when basil is abundant and your pesto could be happily paired with some ripe vine tomatoes fresh from your garden. Unlike basil, parsley is a fairly resilient herb, and in the UK you could probably grow it outside for the best part of the year, and will easily survive autumn and winter in a greenhouse. So this is a winter pesto, an alternative to the classic. It’s a refreshing break from tradition, and pretty delicious too! 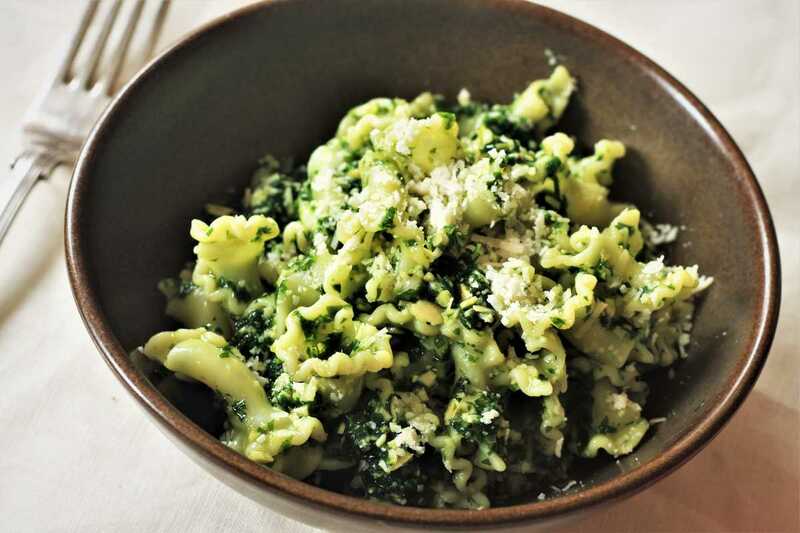 Due to parsley’s more vibrant green colour, this pesto is eye-catchingly bright. There are no tomatoes in season at the moment, but it will go nicely with a green salad instead. You will need a large pestle and mortar, or an electric blender. Pick the parsley leaves from the stalks and finely chop. Add to the pestle and mortar (or blender), along with the parmesan and a pinch of sea salt. Add about two thirds of the olive oil to the mix, and bash with the pestle until a rough paste is achieved. At this point, boil a pan of water and season it generously with salt, then cook your pasta according to the instructions on the packet. Meanwhile, finely grate the garlic clove, and add to the pesto along with the almonds. Continue to grind for about 1 minute, to crush the almonds a little more. If it’s too thick, add more olive oil. Taste, and season with more salt if necessary. Add a generous pinch of cracked black pepper. When the pasta is done, drain it and reserve some of the cooking liquid. Mix the pesto through the pasta, adding a few spoonfuls of the water to loosen it. Serve and eat immediately, with a little extra grated parmesan on top.